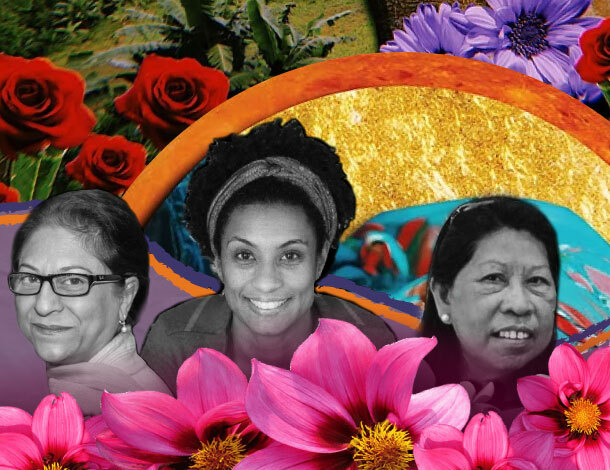 As a Brazilian artist whose work has focused on human rights and feminism, it has been a real privilege to be involved in the creation of the 2017 WHRD Tribute. It’s hard to put in words how much being a part of this project has meant to me. As beautiful and important as it is, it's also one of the hardest projects I've ever done. Although some of these feminists and women human rights defenders lived long lives, too many of them had their lives interrupted too soon, and so violently. I wanted to honor these warriors and, while it was heartbreaking reading their stories I found even more strength to portray them in the most respectful ways possible. I did my best to make their images in drawings good, strong and fierce, like they really were, and how we should always remember them. "I’m sorry that this world has treated you so unfairly. And thank you for your fight". I think about the ways we must work to keep their fight going. It is our fight too. There are many paths to work for a better world, and we all need to find ours. I know mine is through art. It might not be as fierce as what these women did, but I’ll do my best to promote change and honor our warriors. In these portraits, I wanted to show my respect and gratitude for their passage in this world. Even though they're no longer with us, their legacy remains, and we will continue our struggles.